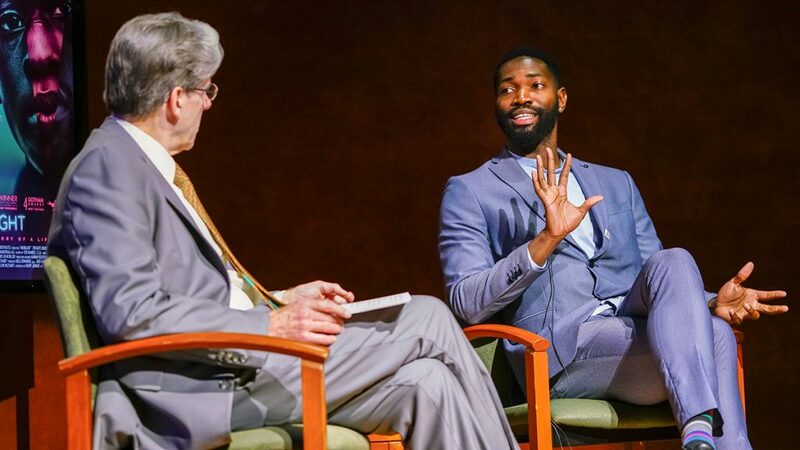 Playwright Tarell McCraney participated in a Q&A session with University of Miami President Julio Frenk Wednesday evening at the Cosford Cinema after a screening of “Moonlight,” the Academy Award-nominated film that was inspired by one of McCraney’s plays. “Tarell is a son of Miami, he is an artist of Miami, he is a creator of Miami and he’s an advocate for Miami,” said President Frenk as he introduced McCraney, a former UM professor, to the stage. McCraney discussed how his play, “In Moonlight Black Boys Look Blue,” was the inspiration for the film “Moonlight,” why he wrote the play and how growing up in Miami shaped who he is today. McCraney said he wrote the play in 2003, shortly after his mother passed away from AIDS. He credits UM School of Communication Professor Rafael Lima, who was his high school playwriting teacher at New World School of the Arts, with giving him the push he needed to start writing the play. “He said if a story keeps coming to you visually, it’s a film. But if it keeps coming to you and you hear it, it’s a play. 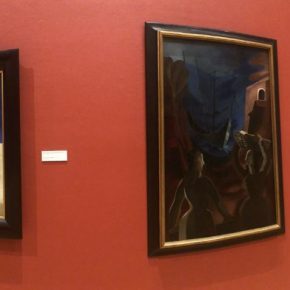 I just wanted to put down the images and capture the scripture of what it was like growing up in Miami at the time,” McCraney said. McCraney took parts of his own life and wrote it into the play, using his memories of the hardships of growing up in one of the poorest neighborhoods in Miami, Liberty City. Juan, the character in the film played by Mahershala Ali, was based on a real person in Tarell’s life: his mother’s boyfriend Blue. “Blue was every bit of a hero to me. I was well aware that he sold drugs. I was well aware that he often got in trouble with the police. But, he was also very good to me, he told me I was good enough. I wanted to honor that memory, but not expunge it of anything that he actually did,” McCraney said. The film’s director, Barry Jenkins, also grew up in Liberty City. He went through some of the same experiences McCarney faced, which made the adaption from play to film much easier. “Its authenticity is what’s appealing about it. Barry Jenkins found a way to use the vocabulary that’s distinctly Miami in the film. People have never seen that part of Miami, and it’s changed the way people are engaged with Miami. The reality of the story is winning folks over,” McCraney said. While the film is based heavily on McCraney’s play, which is most noticeable in the way the film is abruptly cut into three different acts, “i. Little,” “ii. Chiron” and “iii. Black,” McCraney explained the subtle differences between the play and the film. McCraney originally wrote the play in a way that the audience would see bits and pieces of a boy, a teenager and a man’s life, all played by different actors. The audience then figure out at the end that those three separate lives actually made up one man’s life. Jenkins did not believe that would work on the big screen. Thus, for the film, Jenkins created a linear version of his play. The film shows Chiron’s gradual progression into adulthood by using young to adult actors in chronological order. Nonetheless, McCraney states Jenkins was able to transform one of the most vital parts of the play into the film: the way it made the audience uncomfortable. “Barry very deliberately shoots a lot of the film right in front of the actors faces, telling them to talk directly to us. Their uncomfortability is your uncomfortability. That was Barry’s way of taking the theatrical device and moving it into the cinema. It makes you want to back up a little bit, but that’s the important part of the experience,” McCraney said. The film speaks volumes about the journey one man goes through to find trust, love and identity when faced with a dangerous neighborhood, a drug-addicted mother and a confused sexual identity. Since the film was released, it has been met with much praise. “Moonlight” won the Golden Globe for Best Motion Picture – Drama earlier this month and recently received eight Academy Award nominations. When asked if he had anticipated the critical acclaim and positive response the film received, McCraney explained his mixed emotions. “It’s unnerving in ways. I’m a painfully shy person, so a lot of times I am just wishing and hoping I’ll get through it without passing out,” he said. “Moonlight” will be played at the Cosford Cinema daily through the rest of January and will have select showings in February. For more information on tickets and showings, visit the Cosford website. To read Tristan Niskanen’s review of “Moonlight,” click here.